If you’ve been around here for any length of time, you know Lucas. I’ve been meaning to share a video of him when he got to work cows a couple of weeks ago, but you know, other things have taken up my thoughts lately! And before that he had a trip to the vet… and, well, Life. Now’s the time for some great news! 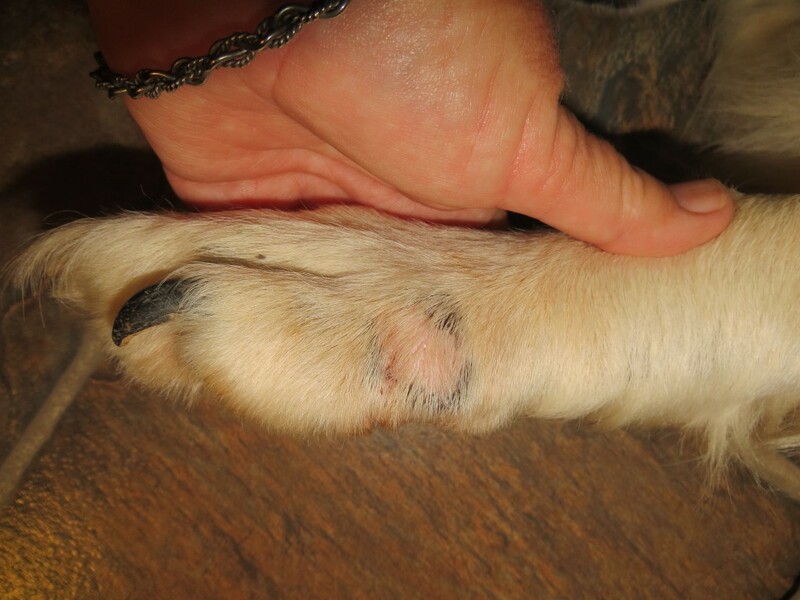 The tragedy and drama surrounding his paw has gone on since he was a pup and was run over. Ever since he was 7 months old, he has had a sore paw due to nerve damage and flipping/dragging it in a weird angle. You can hear it… clump, clump, clump, swish… I’ve doctored it with everything, home remedies, over the counter items, I’ve waxed it and new-skinned it and wrapped it and bought boots. Heel gel soles, vet wrap, and duct tape have been my go-to for years. I’d get it healed up, take him out for a run or short work day, and he’d lose his boot and rub it raw. I gave him pain pills and antibiotics and and acupuncture and laser treatment at the vet’s. There really didn’t seem too much else to try. I just couldn’t bring myself to either amputate it or fuse the joint, and so, he suffered and I felt badly for him. Then a friend posted a recipe for “Blue Power Ear Treatment for Dogs”, a healing miracle for sore ears, but they use it for many other things. Well, his paw is about as far from his ear as you could get, but, what the hell. Now if I still has old photos up with my old posts, I could link to the old photos of how raw this could get… an oozing area about the size of an elongated quarter… but, now you’ll have to use your imagination! It’s healed. Praise the Lord and K. for sharing the recipe with me!!! 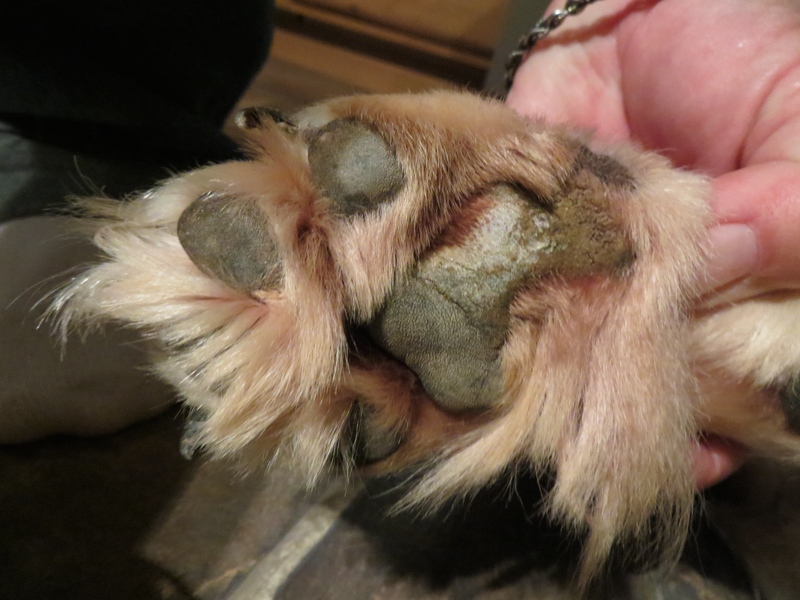 As it healed, the side of his foot began to swell and look like it was filled with pus. I thought he might have an embedded cheat grass head in it, so off to the vet… AGAIN. The vet cut in four places, no pus. He dug around, no seed heads. He did find some kind of crystallized bead sized clumps, just a few, and he was puzzled. I felt sorry for Lucas AGAIN, here his paw was healed and then I took him to the vet to get it cut open for no reason. A round of antibiotics later, and he just has a bare spot where it looked infected. All this time, I thought it was physical. Other people agreed with me. To know that I could have healed this years ago… and saved him all that pain just squeezes my heart! I’m so sorry, Lucas! But, finally, his paw has gone from tragedy to success! Mix and shake well in the alcohol bottle. Shake well before treatment. Put in Clairol type plastic bottle to use inside affected ears. Flood ear with solution, massage, and wipe with a tissue. Gentian violet stains everything, it’s best to do this outside! 2 times per day for the first week, 1 time for the next week or so. Then one time per month, depending on your dog. Works on mites to wax to canker. External use only, keep away from the eyes. I don’t know what gentian violet is, but I do remember some purple stuff we used to use on our horses. Is it known by any other name? Do you get it at the feed store? Just been treating fleas today with 5% Seven dust! Put them on the run! I shall always be indebted to you! Thank you, thank you! This is such wonderful, wonderful news for Lucas! I feel your joy at having found a solution to heal his paw. Praise the Lord! Good news for Lucas. He deserves some help finally. Awesome ,great that you finally found some help.So simple yet very complicated………….. Thank God!!! Thinking of Kris’s Mags. Wonder how it would work on thrush? A friend has a horse here that has it. HMMMMM Thank You for sharing. I know it would, gentian violet is the old standby for thrush! Interesting. I wonder if it wield work on thrush or scratches on horses. I’ll write down the recipe and keep it in mind. It definitely would! Gentian violet is the purple stuff used on human thrush cases for years! What wonderful news Carol. And for Lucas. Living with pain is no joke. Ahh I remember Gentian Violet. Seem to remember my Mom having a small dark bottle of the stuff back in the 1950’s and mt sister and I would end up with a blue stained mouth. I think it was a precursor to teething gel. Autumn has come to our part of UK, but!!! next week when kids go back to school, summer will return :-). Have fun with Lucas. I used gentian violet to cure my daughter’s thrush after all the “new” antibiotics failed. My mom told me about it, not my doctor! I must try this, thank you! But where do I find Gentian Violet Solution? Is there a brand you recommend? And does it burn when applied? Thanks for posting this. I have a hairless Crested dog that gets pimples. I’m always on the lookout for anything that can help her. You can get gentian violet at your pharmacy. My guy told me it was getting harder to find and actually cost me $12! I bought some for my daughter a hundred years ago for her thrush, and it cost $3! And I had spent well over $100 on antibiotics that didn’t work. It doesn’t burn, but the alcohol will. I don’t know of any brand, just ask your pharmacist!